What if God wants you to wait? Most of us don’t willingly choose to wait. We pick the shortest lines at the grocery store and avoid construction routes whenever possible. These are relatively short holdups, but they point to the deeper truth of what we try to evade on the larger scale of our lives: the anguish and heartache we experience during extended times of waiting when something we have hoped for gets delayed. Because waiting is painful and hard, too often we try to rush through it, seeking to jump ahead to the hoped-for resolution, opportunity, or healing. 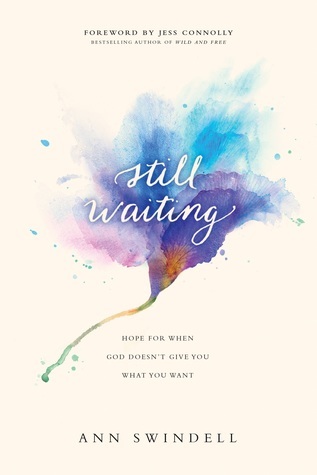 It’s easy to overlook that waiting is an inevitable part of our walk with God. - What did you like about the book and why? I like how the author stays true to God and her faith through all of the ups and downs. She has a great way with words and tells her details so uniquely. - What did you not like about the book and why? I did not think there was anything over the top or dramatic about the style or stories in the book. - What did you learn? When you think that there is something so important that it can not wait, you should always consider God's plan for you and to stay strong. - To whom would you recommend this book and why? I would recommend this book to a faith based individual that can lift the needs of their life to God and believe in the outcomes.